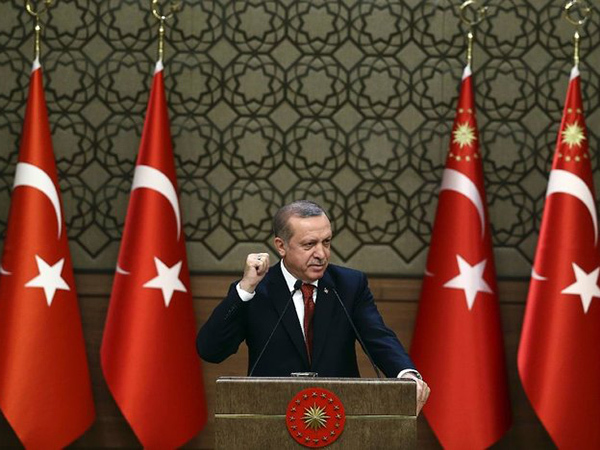 Which One Will Win: Erdogan or Democracy? Home Editor's Choice Which One Will Win: Erdogan or Democracy? Almost two months to Turkey referendum on boosting presidential powers, fear and anxiety have already spread among the supporters of democracy who find the future of Turkey at stake, as the reform to be adopted by the vote may mark the beginning of a dictatorship. Turkish people will soon be called on to make their decision whether they would like the country’s ruling system to undergo a transition from a democratic parliamentary system to a presidential system or not. According to a report by IFP, on January 21, the Turkish Parliament passed a constitutional amendment bill with 18 articles to change the system of government. If approved in the referendum due to be held within two months of presidential approval [in April], the constitutional amendment will effectively convert Turkey into a presidential system of government, giving [its] President Recep Tayyip Erdoğan an opportunity to be elected for two more terms until 2029 — his current term ends in 2019 — and the authority to directly appoint some top judges on the constitutional court and on another judicial body that oversees judges and prosecutors. A presidential system would also authorize Erdoğan to dissolve the parliament and, in the absence of martial law, be able to declare a state of emergency with increased security measures similar to those under martial law. The countdown has begun. Turkish people are approaching the fate-deciding day, the day of the referendum (April 16). In such condition, the fear and anxiety of tumbling into despotism would grow on a daily basis among those opposing the referendum and transition. On April 16, Turkish liberals will once again confront a dilemma of the kind they faced on June 7, 2015, when they went to the ballot boxes to vote for the members of their parliament, doomed the Justice and Development Party (AKP) to failure, even though at the expense of supporting the minority, and prevented pro-Erdoğan candidates form winning two-thirds of the seats in the parliament and, thus, transforming the parliamentary system into a presidential one without holding a referendum. What would be the outcome? Which one would emerge victorious: Democracy or despotism? What would Erdoğan need to win the competition? What balm would heal the wounds inflicted on Turkish people’s soul and pride? Will Erdoğan manage to reverse its defeat in Syria [and the entire region] and turn the tables on those who criticize his policies, thanks to the opportunity provided by the present bewilderment and indecisiveness of the new US government and the resettlement of homeless Syrian refugees — in fact taking them hostage — as leverage to appease Europe, which was criticizing Ankara for supressing Kurds who were truly fighting against the ISIS, as well as secluding a large part of the Syrian territory by imposing a no-fly zone over it? Why is Erdoğan hurriedly seeking to, by hook or by crook, regain the prestige he has lost due to his wholehearted support for the ISIS over the past two years? Why does the victory have to go to him at any cost and as soon as possible? What was the truth behind the 2016 Turkish coup d’état attempt which was, apparently, an excuse for the large-scale suppression of domestic opponents and critics as well as implementing unprecedented security measures in the country? As the referendum date looms, all these questions might be answered one by one. Erdoğan would not consent to a title less prestigious than ‘Sultan Recep the First”. Apparently, the key to the gate of the new Ottoman Empire’s castle is hidden somewhere in the ISIS’ pocket or the Syrian city of Raqqa, where the stronghold of the ISIS’ ringleader, Ibrahim al-Samarrai — also known as Abu Bakr al-Baghdadi — has been built. Erdoğan would require to compensate for his defeat in the Syrian front to secure sufficient votes for his reforms and win the nationwide referendum. Nevertheless, in the meanwhile, Turkey’s good days are certainly to be sacrificed.